Former Soccer Academy Coach nominated for further awards! Below is a copy of the US Soccer press release. Great job again Jill. All at Soccer Academy are hoping for two in a row! 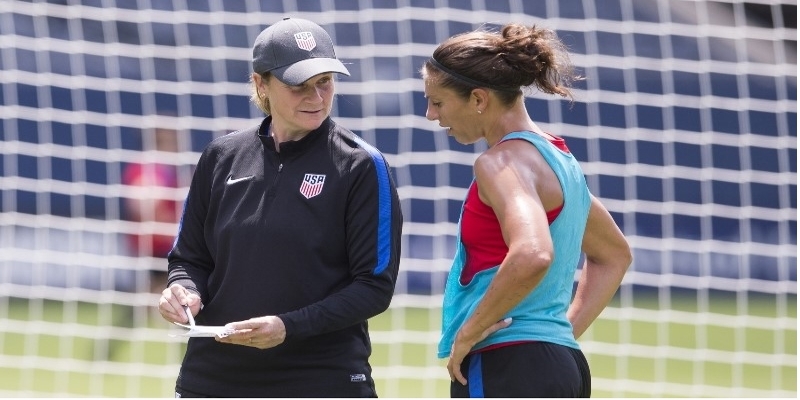 CHICAGO (Dec. 2, 2016) – For the second year in a row, U.S. Women’s National Team head coach Jill Ellis and co-captain Carli Lloyd have been named to the three-person shortlists for 2016 FIFA Best Women’s Coach of the Year and the 2016 FIFA Best Women’s Player of the Year, respectively. Both Ellis and Lloyd made the final three through voting from National Team captains, National Teams coaches, select members of the media and fan voting. The reigning FIFA Women’s Coach of the Year, Ellis is nominated for the 2016 honor alongside Olympic gold medal-winning head coach Silvia Neid of Germany and Pia Sundhage, the Olympic silver medal-winning head coach of Sweden. Despite falling in a penalty kick shootout to Sweden in the Olympic quarterfinal (in a match that officially counted as a tie), Ellis led the USA to a 22-0-3 record in 2016. It marked only the third time the U.S. team has gone unbeaten in regulation time when it has played 10 or more games in a calendar year. Ellis, who previously served two stints as interim head coach of the U.S. WNT, is the eighth official head coach in U.S. history. She earned her 50th win with the WNT on July 22 vs. Costa Rica and now has an overall international record of 58-3-13. Since taking over as head coach, Ellis has won four tournaments: the 2015 Algarve Cup, the 2015 Women's World Cup, the 2016 CONCACAF Women's Olympic Qualifying Championship and the 2016 SheBelieves Cup. After the 2016 Olympics, Ellis began focusing in earnest on building a team to qualify for the 2019 FIFA Women's World Cup. Lloyd, the reigning 2015 FIFA Women’s Player of the Year, scored 17 goals in 21 games and added a team-leading 11 assists in 2016. She is nominated for the 2016 award alongside Melanie Behringer of Germany and five-time winner Marta of Brazil who earned the honor in consecutive years from 2006-10. At the Olympics, Lloyd scored twice for the USA – against New Zealand and France – and had an assist. She became the only American to score multiple goals in three separate Olympics (’08,’12,’16). Her eight Olympic goals put her in second place behind Abby Wambach’s U.S. record of 10. She also became the first player in U.S. history to score 15 or more goals in three consecutive calendar years (15 in 2014 and 18 in 2015). Lloyd, who also fittingly scored the first WNT goal of 2016, had three multi-goal games this year. Against Thailand on Sept. 15, Lloyd was part of seven of the nine goals the USA scored. She recorded her seventh international hat trick and added four assists becoming the first player in U.S. history to have three goals and four assists in a single WNT match. With 96 international goals to her name, Lloyd finished 2016 just four goals shy from becoming the sixth player in U.S. history to score 100 or more. In fact, Lloyd scored 36 international goals between the time she debuted six days’ shy of age 23, and when she turned 30. Remarkably, since she’s turned 30, she has scored 60 goals in just over four years. Lloyd won FIFA’s top award last year after coming off an historic run in 2015 that featured her epic hat trick in the Women’s World Cup Final. Mia Hamm and Wambach are the only two Americans besides Lloyd to have previously won the FIFA Women’s World Player Award. Hamm won in 2001 and 2002, the first two years the prize was awarded, while Wambach took the trophy in 2012. The finalists for the FIFA Best Men’s Player of the Year Award are Antoine Griezmann (France/Atletico Madrid), Lionel Messi (Argentina/Barcelona) and Cristiano Ronaldo (Portugal/Real Madrid), while the finalists for the FIFA Coach of the Year for Men’s Soccer are Claudio Ranieri (Leicester City), Fernando Santos (Portugal National Team) and Zinédine Zidane (Real Madrid). All the awards, along with the FIFA Puskás Award for best goal, the FIFA Fair Play Award and the FIFA Fan Award, will be presented at The Best FIFA Football Awards ceremony at the Zurich TPC Studios in Switzerland on January 9, 2017. The ceremony will be streamed live on FIFA.com and FIFA on YouTube. The winners of the 2016 FIFA Football Awards will be determined through a combined voting process, in which 50% of the decision is based on the votes of captains and head coaches from national teams all around the world. The other 50% is split between online fan voting, and submissions from a selected group of media members from around the world.